KIEV, Ukraine -- Ukraine has banned Mikhail Gorbachev, the last leader of the Soviet Union, after he came out in support of Russia's annexation of Crimea. Ex-Soviet leader Mikhail Gorbachev told The Sunday Times magazine he supported Russia's annexation of Crimea. 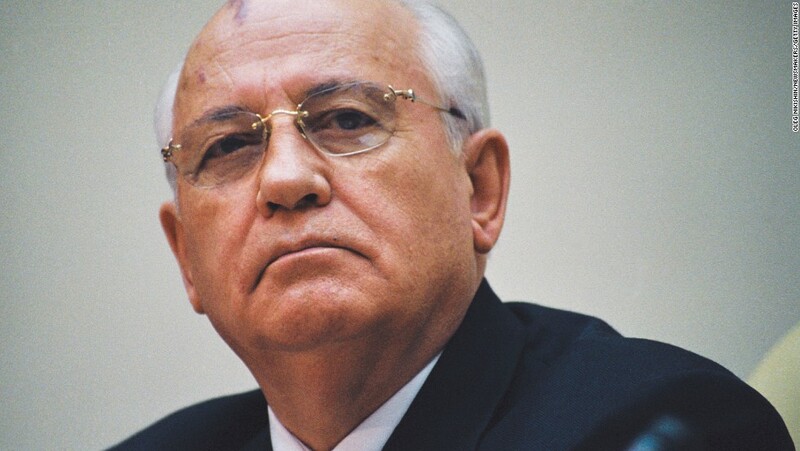 Gorbachev's comments on Crimea are the latest wedge between Ukraine and Russia. The two neighboring nations have been in conflict since 2014 when pro-Russian separatists in Ukraine and Russian forces annexed the Crimean Peninsula following a political crisis in Ukraine. Ukraine's Security Service told CNN the ban was because of Gorbachev's "public support of military annexation of Crimea." Gorbachev's spokesman, Vladimir Polyakovm, said the former leader knew Ukraine was mulling the ban and had earlier brushed it off, saying he did not travel to the country anyway. The ban comes after Gorbachev gave an interview this week to The Sunday Times magazine, saying he would have acted the same way as Russian President Vladimir Putin on Crimea if he were Russia's leader today. "I'm always with the free will of the people and most in Crimea wanted to be reunited with Russia," Gorbachev said in the interview. He also accused the United States of "rubbing its hands with glee" over the demise of the Soviet Union. Gorbachev led the Soviet Union from 1985 until his resignation in 1991. During that time, he embarked on change and increased openness to the West in a policy that was known as perestroika. He was awarded the Nobel Peace Prize in 1990 for helping end the Cold War. "No. Commenting is your cup of tea," and that "those in the journalistic profession have a great deal to talk about and to discuss." The Crimean Peninsula was annexed through a controversial referendum, which returned a large majority in support of joining Russia. The United States and Europe introduced a wide range of sanctions against Russia in an effort to pressure Moscow to back down from aggressive moves against Ukraine. Most recently, the two countries bickered over Nadiya Savchenko, a Ukrainian military pilot who was detained by Russia for two years, and two Russian soldiers held in Ukraine. The pilot was released this week in a prisoner exchange. The two Russians arrested by Ukraine were sent home as part of the exchange, Tass said.